These have a bouncing ball that also goes around and back and forth. A bright pointer tip and are very easy to see. I hope you like them. You'll build up the cursorXP database yet! What can I say - I love it. Very creative and nice animations. Thank you guys very much! It's hard to be creative hanging around you guys. It's sure nice to get comments from people that produce work like you guys and I thank you very much. 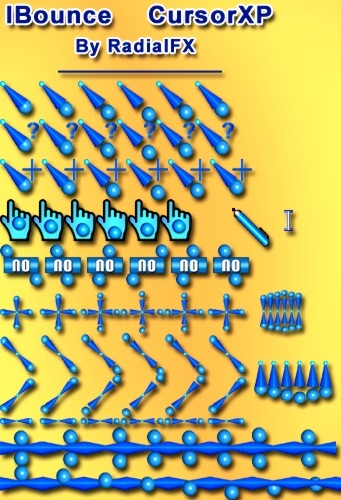 very nice cursors,Just the right animation, not to busy.I would like to see more colors. GREAT JOB!!!!!! Being a big fan of blues - I love these. Very cute! Thank you for sharing!